Most people think that compression socks are for the elderly, however compression stockings are designed for women of all ages and are great for those people who are constantly on their feet, have to sit for long periods of time, or are runners. Compression socks not only can relieve tired and painful feet as well as leg conditions but they can also keep your legs and feet healthy before such conditions arise. So, here is a look at some of the best compression socks for women. This Mojo Coolmax Compression socks are designed for women who enjoy being active. They are knee high and highly stretchable, easy to put on and take off as well as engineered to follow the contours of your foot. 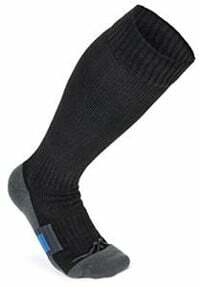 These socks are medical grade 20-30mmHg and are made of 70% nylon, 15% spandex and 15% coolmax. They boost circulation in the legs and feet helping to reduce leg and foot swelling and tiredness. They are extremely well made and nice looking. These Vitalsox socks are patented to be used for training, racing and recovery after running or spending long periods on your feet. They have dry/stat which is moisture wicking and will prevent bacteria and mildew growth. In addition, they come in sizes extra small, small, medium, and large as well as 11 colors. 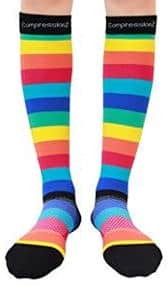 Made in Italy, these knee high socks help reduce leg pain and fatigue, prevent swelling of the legs and feet and increase leg and ankle comfort. These Buttons & Pleats Compression socks are medical grade with 15mmHg to 20mmHg compression. They come in small/medium, medium/large and the only color is black. Users find that these knee high compression socks make their legs feel refreshed and they help prevent blood clots. They are great for people who are on their feet for long periods of time and reduce the swelling and tiredness of their feet and legs. 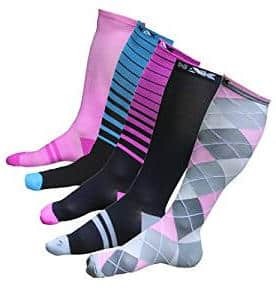 These Sockwell women’s compression socks offer a compression strength of 15-20mmHg and come in two sizes small/medium and medium/large as well as a large range of colors. They minimize or eliminate feet swelling and reduce feet and leg fatigue. They also have a cushioned sole and seamless toe. Users love that these knee high socks are made in the USA and offer support for those with varicose veins. They also like having a choice of nice colors and patterns. These footloose knee high compression socks have a graduated compression of 15-20 mmHg and are made from 90% nylon and 10% spandex. They regulate blood flow and prevent muscle fatigue. They come in sizes small/medium and large/Xlarge and are not overly tight feeling on the leg. Most users find them to be comfortable and state that they wash extremely well. They help to prevent shin splints as well as leg injuries and come with a money back guarantee. The A-Swift Performance Compression Socks have a compression 20-30mmHg and come in small, medium and large as well as in 7 bright colors and cool designs. 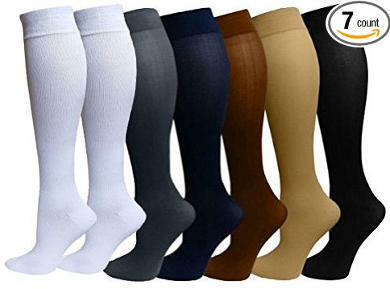 These knee high socks are made from anti-bacterial material which is anti odor and anti-static. They reduce swelling of the feet, ankles and legs, minimize leg pain and fatigue, and help to prevent the growth of bacteria and fungus. They also reduce odors and keep the feet dry and comfortable. 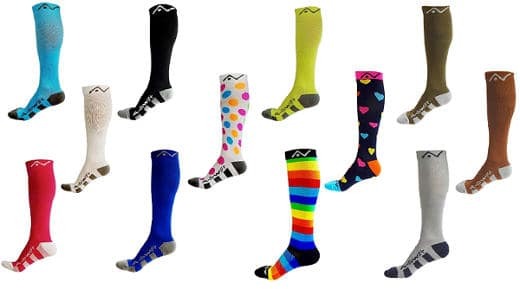 These CompressionZ socks come in small, medium, large and Xlarge and several bright colors. They are designed to improve circulation in the feet and legs, and therefore reduce swelling and lactic acid build-up. Runners and those users who are on their feet or sit for long periods of time say that these socks help to prevent injuries and relieve feet and leg pain. They are super cute, easy to wash and wear well. 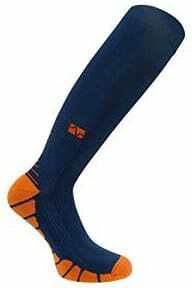 These Nak Fitness knee high compression socks come in two sizes medium and large as well as in 5 colors and prints. They are great for runners or people who must spend long hours on their feet. They reduce muscle soreness and help improve circulation. They also reduce the risk of shin splints while relieving pain and fatigue in your legs and feet. The Wanderlust Air Travel compression socks come in 2 sizes medium/large and large Xlarge. They are 80% cotton, 6% polyester, 9% Nylon and 5% Lycra. The compression varies. They offer 25-30mmHg compression at the feet and ankles, 15-20mmHg in the middle of the calf, and 10-15mmHg under the knee. People review that they reduce swelling, relieve pain and fatigue and improve circulation. They also have a seamless toy box, extra foot padding and are easy to get on and off. These Nurse Mates women’s compression socks are only available in one size 5-10, but come in several different fun colors and designs. They have a compression of 12-14mmHg and a comfortable built in toe and heel pocket. They fit well and reduce leg fatigue and swelling. This microfiber blend consists of 87% nylon and 13% elastane. These Sockwell socks come in two sizes small/medium and medium/large. They also offer a choice of several different colors. Made up of 32% Merino wool, 32% stretch nylon, 31% bamboo rayon and 5% Spandex, they are made in the USA. They have a light cushioned sole and an arch support. They reduce swelling and pain in the feet and legs as well as minimize leg and foot fatigue. Users like that they appear to look just like regular socks and not at all like compression ones. 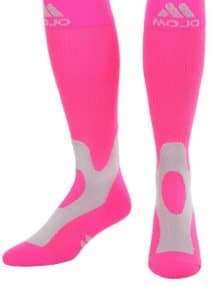 These Mojo Compression socks come in 20-30mmHg compression, they are knee high, come in size medium and are available in one color pink. They boost circulation and are great during and after workouts. Overall, users review that they are a good fit. They ease ankle and leg pain and relieve fatigue and swelling. They wash well and users who stand or sit for long periods of time find these socks incredibly helpful. 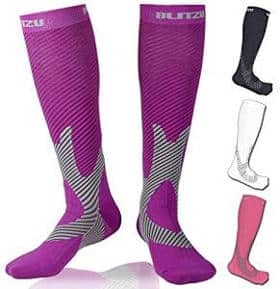 The Blitzu compression socks are medical grade knee high graduated leg support stockings that are designed to improve circulation and prevent swelling while lowering the risk of shin splints. They also reduce ankle and leg pain as well as help relieve leg and foot fatigue. They combine kinesiology taping with the performance of the compression stockings and come in sizes small/medium or large/Xlarge. You have a choice of 4 colors, white, purple, pink, and black. Users find the colors to be cute and like the fact that they improve circulation. 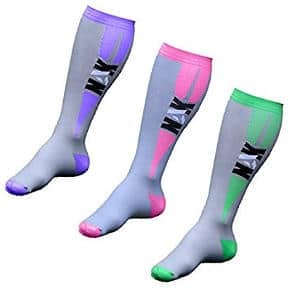 The Nak Fitness Graduated Compression sock comes in 3 great color combinations and in sizes medium or large. The sock itself is made of a mixture of spandex and nylon and is designed to improve circulation, reduce injuries when exercising, help prevent muscle fatigue when sitting or standing for long hours while providing arch support for your foot. Users mention that these socks have a cute design and hold up well to washing. All in all, if you are a runner, spend long hours sitting or on your feet, or you suffer from swelling of feet or ankles, fatigue or pain, one of these pairs of good compression socks for women should be right for you.